A family of primary conveyor belt cleaners has been engineered for the world’s fastest, most heavily-loaded belts, with industrial- strength construction that delivers effective cleaning, minimal maintenance and long service life, even under punishing conditions. Martin® SHD Cleaners have been proven on belts up to 10 feet (305 cm) wide — with speeds as high as 2,000FPM (10m/sec) — carrying loads up to 300,000 tonnes per day. Designed with patented ‘CARP’ technology to achieve constant angle geometry to match pulley diameter accurately across all stages of service life, the massive urethane blades deliver up to 42 square inches (271cm2) of wear surface — more than seven times the wearable surface of standard cleaner designs. With a broad range of colour- coded, high-performance blade choices available, the cleaners can be specified to suit a wide variety of materials and performance requirements. The SHD Series was developed for super heavy-duty applications, with structural steel components to prevent bending of the main frame. The extremely durable construction helps eliminate carryback, reduce emergency outages and minimize unscheduled downtime. In some applications, it has been shown to be the only design that can withstand the severe operating conditions. The SHD 1200 Series Cleaner is built for high-speed conveyors with a head pulley larger than 48in (122 cm) in diameter and belt widths from 42–120in (10–305cm). With blades up to 12in (30.5cm) tall, a heavy structural steel frame prevents bending, even with high tonnages and large lumps. The SHD 1200 Series Cleaner was designed in tandem with its tensioner system to provide effective cleaning and reduced service requirements. Fully compatible with reversing conveyors and belts with mechanical splices, it has a service temperature range of –30°F to 300°F (–34°C to 149°C) and can be used in corrosive conditions or underground applications. Like its larger cousin, the SHD 600 Series Cleaner is installed in the primary position, but is designed for pulleys smaller than 48in (120cm). Built for tough, mine-grade cleaning, the unit ‘s durability has been proven in some of the bulk handling industry’s toughest applications. “The SHD Series was originally designed for a severe-duty mining application, built to handle the overburden at one of the largest pit mines in the world,” Marshall continued. “Every cleaner they tried was getting destroyed by the harsh conditions. 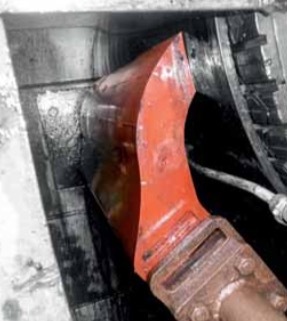 There just wasn’t anything on the market that could withstand the speed and abrasive forces, so we completely re-engineered the conventional belt cleaner design, from the I-beam frame to the huge blade segments. In fact, these cleaners are so large that we had to invent a way to properly tension them,” he said. The SHD product family is finding utility in a variety of industries, wherever applications involve large high-speed belts. The series is among a number of Martin Engineering products helping conveyor operators satisfy the demands for larger, faster systems that can move more material, without sacrificing safety or component longevity. Founded in 1944, Martin Engineering makes bulk materials handling cleaner, safer and more productive. The company supplies flow aids and conveyor products around the world for a wide variety of bulk material applications, including coal, cement, rock/aggregate, biomass, grain, pharmaceuticals, food and other materials. The firm is headquartered in Neponset, IL, offering manufacturing, sales and service from factory-owned business units in Brazil, China, France, Germany, Indonesia, Mexico, South Africa,Turkey, India and the UK, and under exclusive licence with ESS Australia.